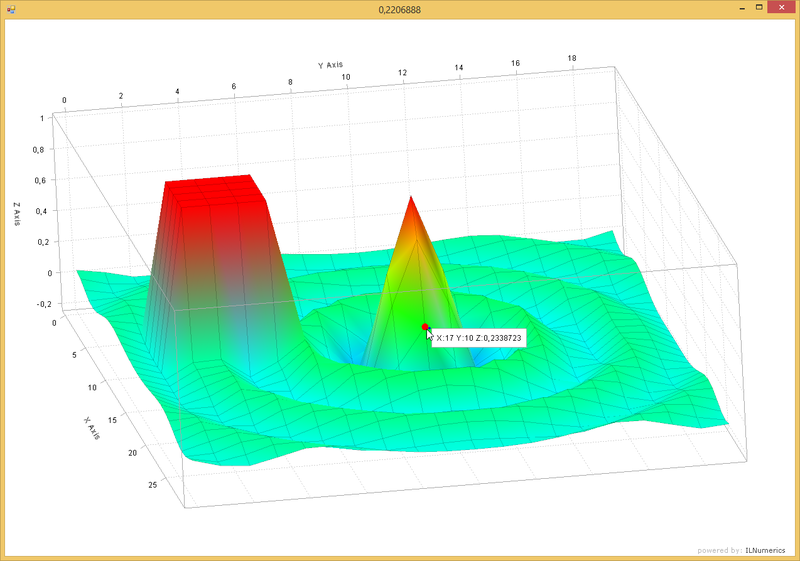 A 3D plot based on a surface is created. Custom mouse event handling performs 3D picking on the object interactively. The information obtained from the picking routine is used to mark the 3D position of the mouse (not the screen position!) and the nearest 3D vertex with blue and red dots correspondingly. A tool tip label is displayed when the mouse hovers over the big red dot marking the nearest vertex. The example gives insight into the application of the ILPanel.PickAt() method which is used to acquire detailed information about the 3D object at a specific screen position. It uses mouse event handling and combines 3D plot objects with regular scene graph objects in order to create a flexible and highly interactive application.